Create animated Process Landscape Diagrams yourself by signing up for a Trial Account. The Step-by-Step Guide is waiting for you in your Digital Workplace. This is an example Process Landscape Diagrams created on Dragon1. Dragon1 is a collaboration platform, on which you as Business Professional can learn, create, share and control interactive content. A Process Landscape is a coherent set of interconnected processes within an enterprise, business or organization. It shows the structure, grouping, modularity, functionality and technology of chain processes, business processes and working processes. Also in combination with business functions, business services, business capabilities, business activities, business objects, departments, roles, competences, locations and environments. Why was this Process Landscape Diagram created? 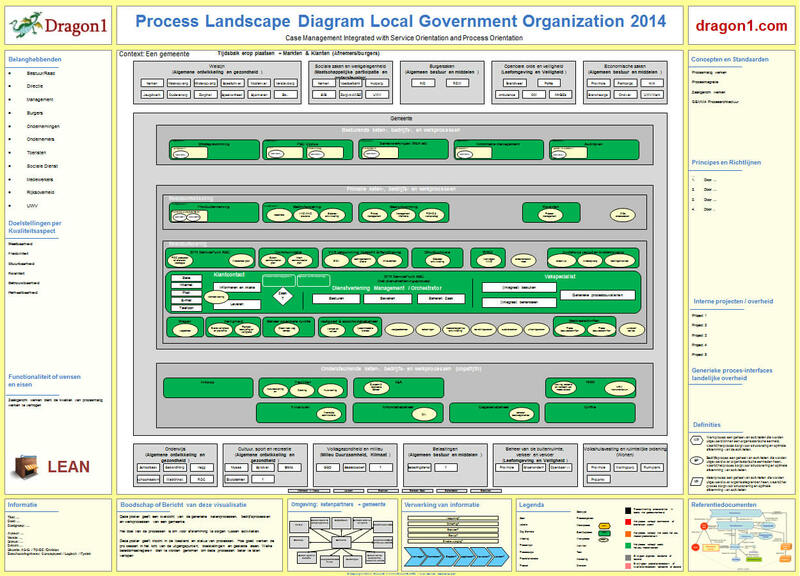 This Process Landscape was created for a municipality to create an overview of all the business processes and how they relate to each other. This overview supported the projects that were doing changes to the business processes. Speed up Results You can have your version of the process diagram after days by only updating the example. Repository Collaboration You can be productive as a team working together on process diagrams.